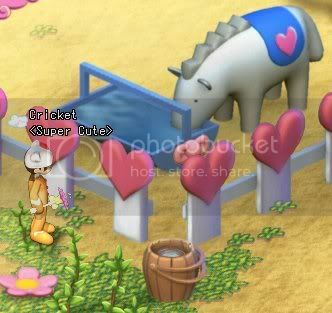 During the Happy Hearts Event my blog was picked for Blog of the Week! A big thank you to everyone who has been reading my blog, checking me out from blog of the week and a super big thanks to everyone who comments! I hope you all enjoy my ramblings…or at least find them somewhat amusing. which means I can get caught up on school work and cleaning. It’s Day 3 (already?) of the Happy Hearts event. I’ve finished all the quests that I know about. At first I wasn’t a big fan of the quests being given out one day at a time, but it’s actually working out better for me. I don’t feel like I have to be in-game all the time and rush through everything. Guy is my cur. I forget where I got him. I might have kidnapped him from Grandpa Anthony. (Trust me, it was for his own good!) We have been on many adventures together. Chompy McBitesalot came from the Monster Wrangler event. He may look ferocious, but he just talks about poop a lot. 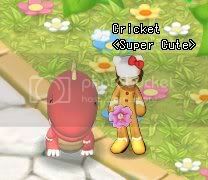 It was a happy, happy day when I found out you could turn off speech bubbles! Gizmo is the fox and I got him this morning. He is by far my favorite. Don’t tell the others! 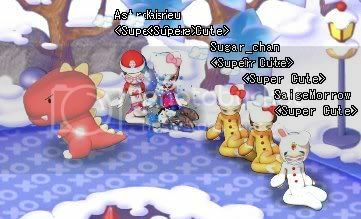 During FB my guildmates and I chatted about which monster we would get if they were all available. My top spot was the fox, followed by the skunk and the bee! I had forgotten this until someone with a pet skunk walked past me. I rushed to the skunks and slughtered away until I finally got a pet card. I figured I would get rid of Guy or Chompy to make room, only when it came down to it I couldn’t let either of them go. Do they still run away? I’m too scared to find out. I wish we had a little pet corral on our farms. That would be so adorable! Speaking of farms, I am kind of digging the new system. True, I’ve only harvested strawberries, but it was very easy. I do feel panicked without a pause button, but I guess I’ll get used to it. I suppose we were pretty spoiled by that. I still have my level 1 farm, and like all things in life I am hesitant to let it go. I know the new farms are super cool looking and I’m going to need one eventually, but I think I’ll stick with this one a little while longer. This is Barney. Why can’t he come to my new farm? I am going to miss him! 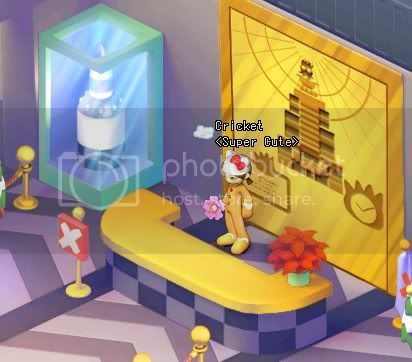 It’s been pretty quiet in Sanrio Land. Maybe it’s just the times I have been on, but there never seems to be a lot of people online. I’m sure that will end tonight when they open it up to the whole world*. It’s been nice when it comes to gathering resources, but I miss all the people! Was Happy Hearts announced too late or did people just not come back? I’m sure it’s going to be absolutely crazy tonight! Hopefully the servers can handle it, although I know they’ve had issues every single day thus far. Kind of makes me nervous, but we’ll see how it goes! I hope to see you all in game! Feel free to say hi if you see me. Let’s wrap this up, shall we? Woah, it’s been a minute since I’ve been here. If you’ve checked the about me page you’ve seen that I started school part time. Part Time school + Full Time job = no spare time! I had a few more things I wanted to post about the Christmas Founder’s Reunion and now seeing that there is going to be a Valentines Reunion/OB I need to hurry up! So let’s travel back to December. It was the final day of the reunion and luckily I had gotten everything done. I was prepared to take it easy and help anyone that needed to complete quests. Little did I know that I was going to be the one needing all the help. Surprise, it’s a last minute event (torture device?) called Designer Depot. Guilds can custom design t-shirts and hats which is really, incredibly awesome, but here’s the catch, you have less than 24 hours to get everything together. Ummm, what? I’m going to be completely honest, it was horrible for me! I was the only guild representative online and I felt that put me in the leadership roll. I immediately panicked about everything that needed to happen. Our entire guild needed to make a group decision about colors and a design, except, there were only 4 of us online. We came up with a pretty basic design concept that the 4 of us agreed upon, but would everyone like it? Did we have time to wait? That’s how it was pretty much all day. People coming into the game and me having to explain the t-shirt thing over and over. Everyone having different ideas. People not being able to afford what we came up with. Plus, the pricing and rules were crazy complicated! I hope I did the math right! ::crosses fingers:: Then I had to stay on my farm most of the time so people could bring me money. (Not to mention I felt like I had to stay in game all day) I am most definitely happy to help my guild in any way I can, but these last minute things really get to me! I am a planner and organizer by nature, and this was chaos. Please HKO, no more!!! Give us time to make something decent! 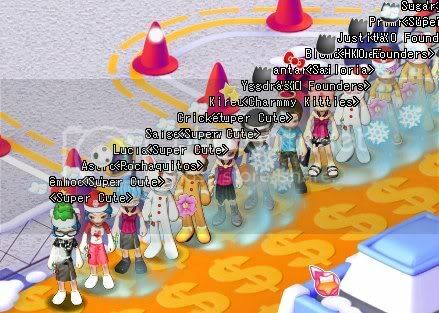 We (and when I say “we” it was me and whoever was in game and responding at the time these decisions were made) decided just to do shirts and save the hats for when/if they do this again. Our shirts are going to be light blue with a pink design. 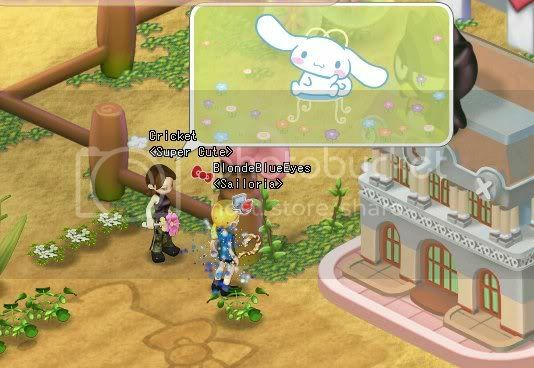 Our design is the word “cute” and a cloud (to represent our guild mascot cinnamoroll). Luckily Sej knows her way around photoshop and was willing to put some visuals together for us to vote on. Thanks again Sej! I know it must have been maddening! We all ran into my house and started taking pictures. This has got to be one of my favorite traditions, the last day screen shots! Hey Alesana, get off SaigeMorrow!! That’s better! ^__^ From here we decided we needed group pictures in New York. It took some of us a little longer to get there than others seeing as how some people had come to my farm from New York and some from Londan. I had come from Londan. We met up at the Empire State Building. I missed out on some of the fun due to my long cross country trek. There was a girl from another guild there. She came and sat with us, but never said a word. I wish I had gotten her picture! Next we went to the ice rink in Central Park. YAY!! 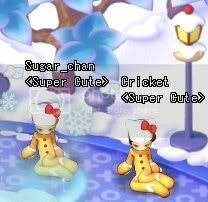 A Sugar chan and Cricket screen shot. We have been real life friends for over 20 years now, so it’s always fun to hang out together. I think the dinosaur just farted on us and ran away! A few of us went to visit Santa and sit on his lap. He should probably come with a weight limit. We are crushing him! Sometime during all of this I had to run all the way back to Londan to turn in the t-shirt money. I think I was the last one because it took me so long to get there. GM-Zel was super nice. Then it was all the way back to New York for more screen shots. I must have lost 5 lbs. from all the hiking!!! so we jumped in. I believe there was some caroling, done mostly by me. Then the line kept getting bigger and bigger till there was no line at all. I kept trying to ask this girl where she got her sweat shirt. (Oh man, I just noticed her super sweet shoes!) There was nothing like it in the item mall, but she never answered me or my PM’s. Oh well. With the giant influx of people my computer started lagging like crazy and I’ve never been a big crowd kind of girl. I politely excused myself and went back to the ice rink. I sat there and read everyone’s last minute goodbyes and then HKO Founder’s Reunion was over. I’m really happy we had the chance to go back. It was a fun experience, really insane quests and good times with my guild. I’m looking forward to more of the same with the Happy Hearts Valentines Event. I probably won’t be on as much because of school, but I look forward to seeing everyone soon! Once I learned that the Founder’s Reunion was going to be all about Christmas I knew I wanted to get presents for people. Then it hit me, why not arrange an in-game Secret Santa? 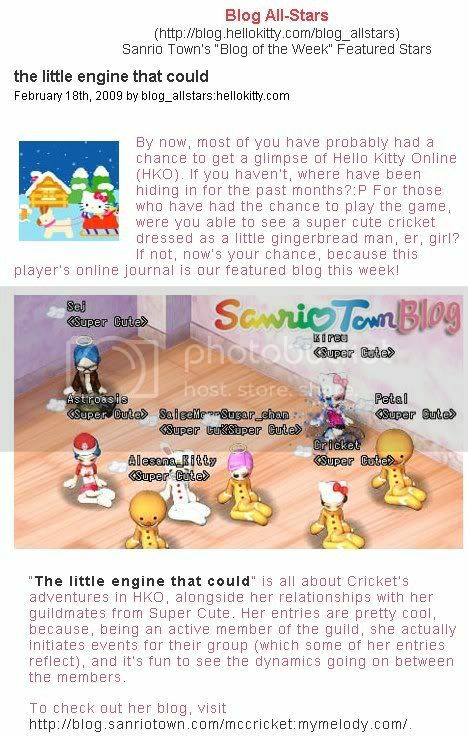 My brain usually goes to the extreme and I was originally going to open it up to the whole Sanriotown forum. 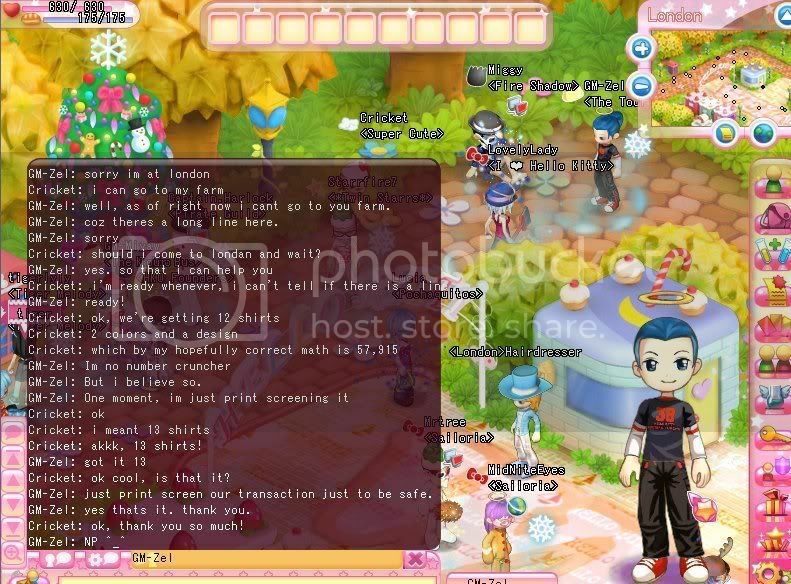 Don’t get me wrong, I adore my guild, but I also like interacting with new people. I thought something across guilds (and involving the guildless) would be fun. However, when I started mapping out how to go about this I started considering time zones and varying schedules and realized if I opened it up to everyone I could easily get in over my head. So instead it became Super Cute Secret Santa. I was a little embarassed after I posted the idea. What in-game presents could people possibly need? As lame as I felt my idea would be in practice, 7 people expressed interest and excitement. This in turn got me excited and I felt a whole lot better! To put it together I had everyone that was interested email me. Then I wrote down names and did a random drawing. 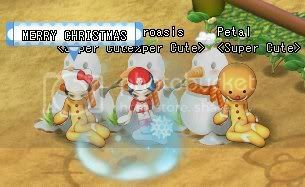 I emailed my guildmates with the name of the person for whom they would be Secret Santa. Next, everyone posted their wishlists in the forum. 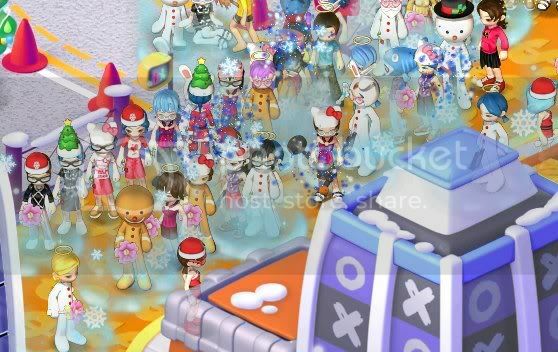 The most sought after items were those for the Christmas quests. People also listed seeds or things they collect. No one was looking for anything outrageous and I was truly grateful that all involved were in it for fun. I kept tabs on everyone to make sure things were running smoothly. I think there were only 2 problems. The first one was easy enough. I emailed 2 people through forum email and at least 1 of them didn’t receive my email. However, it was a small problem and took little time to fix. I discovered the second problem during the random name drawing. If someone were going to be my Secret Santa it wouldn’t be a secret. It was with a heavy heart that I realized I wasn’t going to be able to participate. Halfway through the reunion I voiced my sadness to Sugar chan and Astroasis. Both encouraged me to make a wish list and post it on the forums, so I did. Christmas Stars, Mistletoe and Candy Canes because they were so cute. Snow because we needed so much! and snowman seeds because I <3 the snowmen. Hopefully I’ll still have my seeds when OB starts!! Once again, my guildmates proved themselves to be the most awesome people in the world! Well, one day Astroasis shows up on my farm bringing tons of snow, 20! snowman seeds, lemons, oats, strawberries (and probably some other things I’ve forgotten). I was floored! Throughout the reunion she gave me at least 500 snow. It was amazing! 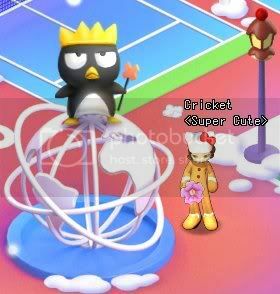 I am so happy Astro decided to join Super Cute! (and not just cause she gives me stuff!) She is super hilarious and definitely a good friend. She’s been there for my venting when dealing with one thing or another. 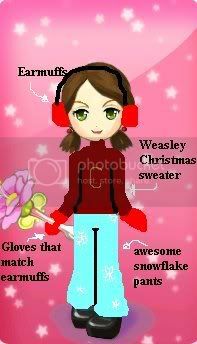 ^__^ Astro: You were the best Secret Santa ever! 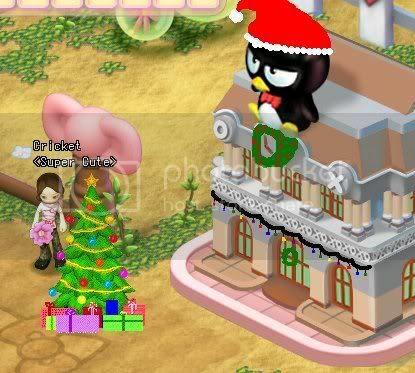 Petal also showed up bringing Christmas items from the monster drops. (stars and canes and mistletoes) I was shocked and so happy! Pheona gave me 100 lemons which I split with Kimberly and Kimberly gave me the bee stingers guide. 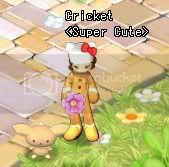 I know the bee stinger wand is low level, but I want to know how to make everything! ^__^ I’m pretty sure other people helped me out too, I need to write these things down. 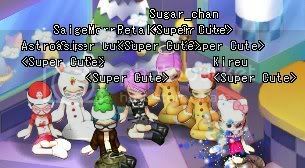 So, a very special thank you to Sugar chan, Astroasis, SaigeMorrow, Alesana_Kitty, Petal, Kimberly and Kireu for making the Super Cute Secret Santa a great event and super fun time! You guys are awesome! It’s no secret that we needed a lot of snow during the Christmas reunion. 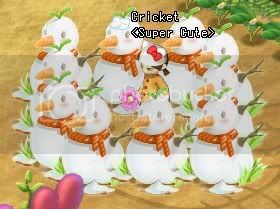 I thought the snowmen were hilarious and secretly desired to plant them all over my farm. However, I’m not a terribly dedicated farmer so I only planted three. 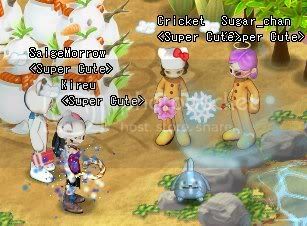 I collected bit by bit and my guildmate, Astroasis, would bring me her leftovers as well. I went to thank her and to my horror discovered this! 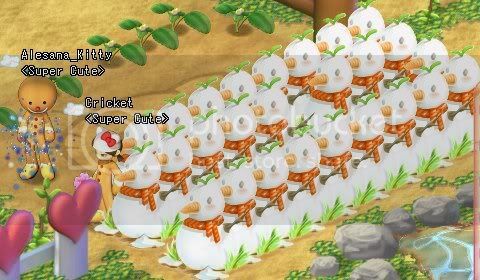 She had raised a snowman army and by the looks of it she was recruiting!!! * Emi RUN! 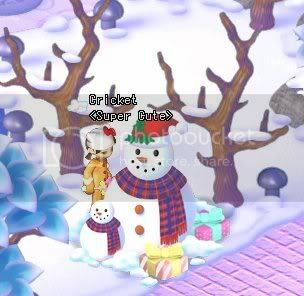 I had to get out of there quickly before the snowmen got me too! 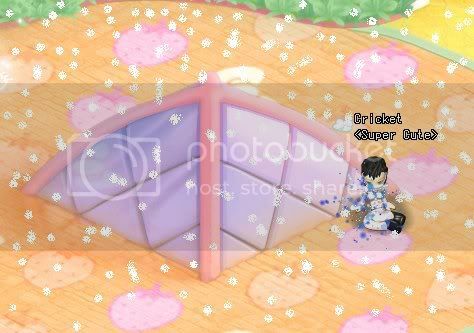 I raced to Alesana_Kitty’s farm. As I got closer I could hear chanting. ::you will join you will join:: I became dizzy and lost track of time. When I woke up I had joined Alesana’s snowman army. 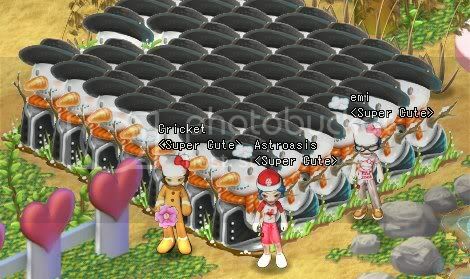 She was preparing an attack on Astro’s farm. Knowing we were outnumbered, I sneaked away when no one was looking. 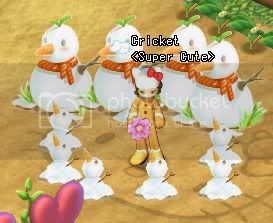 Once back I looked at my 3 snowmen and knew there was no way I could defend myself. Sometimes desperate situations call for desperate measures. I had to raise my own army and fast…. Unfortunately my army wasn’t very intimidating. Astro visited while I was afk and played amongst them. Perhaps I wasn’t clear on the definition of “crush them” during training. Happy New Year’s Eve everyone! I hope you have had a good 2008 and will have an even better 2009. Thanks to everyone in my guild, you guys are awesome, to everyone that has helped me in game and to those who come and read/comment on this blog! You have all made my 2008 that much better! ^__^ Have a wonderful (and safe!) New Year’s!!! I hope everyone had a nice holiday. I spent Christmas with my family and got loads of cool presents. ^__^ The one I’ve been using the most is my new Nintendo Ds. (hurray hurray) My students will be excited because I promised to bring it in (if I got it) and show it to them. Now on with the tour! I cashed my paycheck and went off to buy gifts. I couldn’t quite figure what to get everyone, but I did my best! 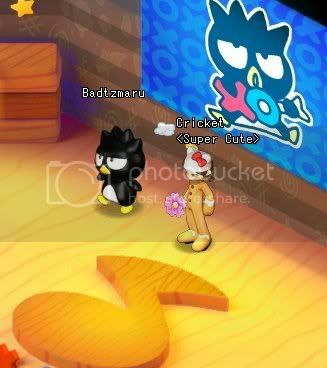 I went to take Badtz his present and accidentally walked in on the dress rehearsal for his new show “Badtz Man Group.” Having heard about my unforgettable performance in “El Fromage” he asked if I would come up and do some improv with him. We had a lot of fun! He asked me to join him in performance once I had finished my quests. Wait? Quests??? What quests???? I realized that begging in New York is useless. If I wanted to finish these quests in time, I was going to need more money. A lot more! Going back to my job at the Empire State building wouldn’t be enough, so…. I kidnapped the New York Yankees and held them hostage! 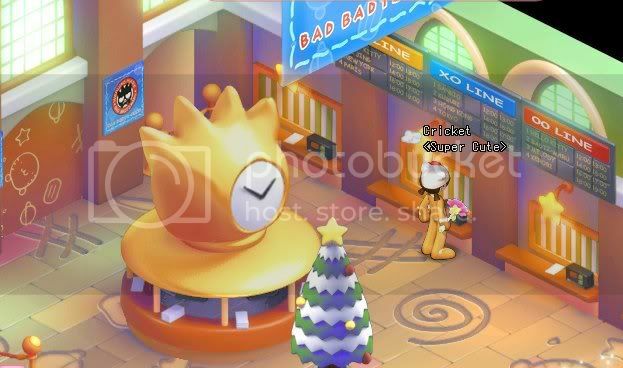 Once their ransom had been paid I was able to finish the quests and even do some looking around in the mall! I can’t wait until they have home furnishings in stock! And what Christmas tour would be complete without a visit to Santa? I hope you enjoyed my tour through New York. I really did enjoy the quests, even if they were punishment! I hope you all had a wonderful holiday and had time to spend with your loved ones. Merry Christmas everyone! A trip back to Sanrio Land was the perfect way to kickstart my holiday! I had a wonderful time. As usual, I took a lot of pictures but was too focused on the game to post them. Here is my tour of New York City! I also stopped in to see Pochi. Oh really? You don’t say. Pochi fancies himself a comedian…a gluttonous comedian. Next up was Grand Central Station. With my travel plans on hold, I decided to do a little Christmas shopping. Man, I wish I had that bike to ride through Sanrio Land! Finding myself low on funds, I went looking for a job. Luckily they were hiring at the Empire State building. I sold tickets, gave tours and worked the info. desk. Finally I earned enough money for Christmas presents so I quit! People can be really rude when they need information and I was only making minimum wage! I’m just getting started with New York! To be continued in part 2! I am so excited about the Founders’ Reunion! I’m most excited that the Founders’ Reunion is going to have a holiday theme! From what I can tell we will be saving Christmas by going on holiday missions, plus the maps are going to be changed and have a Christmas theme to them! Not to mention the opening of New York and finding out where our names will be permanently enshrined. I forgot to warn you about my awesome MS Paint skillz! ^__^ HA! 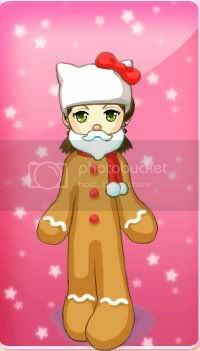 In order to get into the Christmas spirit Sugar chan and I will be baking cookies. I have cute Hello Kitty cookie cutters, so if they turn out well I’ll post pictures of our results! 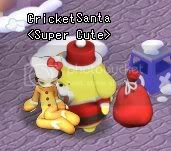 I’m also going to see if anyone in my guild wants to do an in-game secret santa. I thought about asking the whole forum, but I would probably get in waaaay over my head. I would love to do something across guilds, but it is probably best to leave big events up to the GM’s! 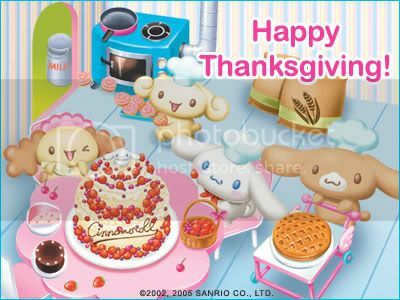 I will see you all in Sanrio Land soon! During Founder’s Beta my farm was my sanctuary. A place to hide when lag got to be too much or if I just wanted to chat. To my surprise it attracted others too. Their arrival remains a mystery but I have documented their presence. During the New York build I left the game on when I went to sleep so others could continue to build on my farm. This plan backfired during the competition, but oddly enough worked once the contest was over. 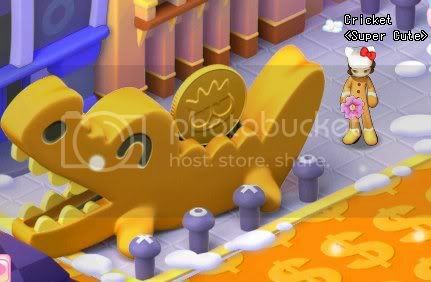 I went to bed one night while several guildmates worked away on Grand Central Station. When I awoke something was different. A strange dog named Vincent was guarding the station. I say “strange” because he was not mine. I tried to offer him food, but he would not budge. I went into Londan for a bit and when I came back he was gone. I later found out he belonged to a guildmate who had been working on my house, but she had left hours before. Perhaps there was a strong force keeping Vincent with me. 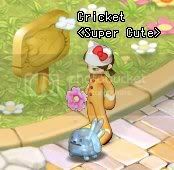 Then, the last day of FB I was running all over the place helping people with last minute quests, finishing up houses and emptying my inventory. (I feel that last one might have been a mistake on my part >__<) I made frequent stops to my farm and discovered I wasn’t alone! BlondeBlueEyes from Sailoria had come to my farm, but was now immobilized! I tried to unfreeze her but nothing worked. Perhaps it was a spell from the Kevs or maybe she was trapped in a time warp. Either way, she figured out how to escape! It is a strange phenomena indeed and one I will keep a close eye on when the game continues! 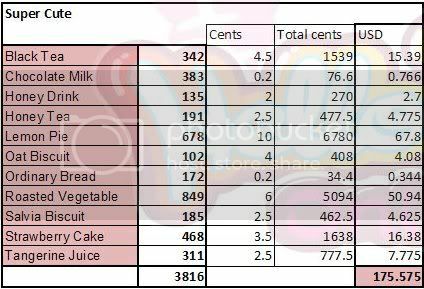 Super Cute donated almost $200 worth of food! I know that’s only a drop in the bucket, but I am proud of everything we accomplished. We knew early on that there wasn’t much chance of us winning. (A guild of 28 against guilds of 150-200?? no way!) We worked on this out of kindness and a wish to do something for others. Everyone, across all guilds (and players that donated indiviually) did amazing work! I am always very excited to share that I was part of something that raised over $12,000 for Unicef and the Asian Youth Orchestra. Also in the spirit of giving I would like to share a couple of websites where you can donate free food everyday! 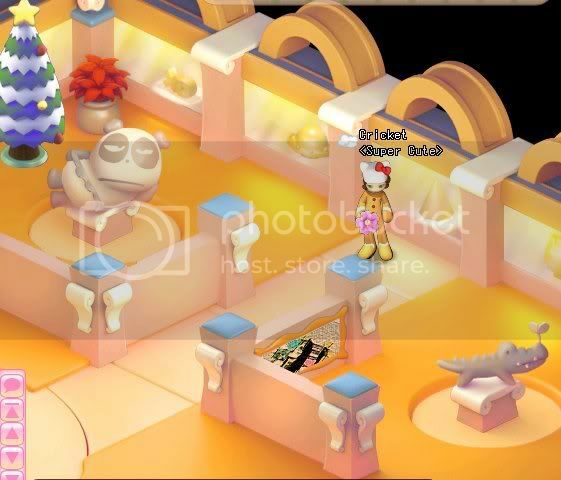 At freerice.com you can play games that donate food to the UN World Food program. You can play and donate as much as you want. Free Kibble and Free Kibble Kat donate pet food to different animal shelters across the US. You can answer 1 question a day at each website. I hope everyone had a great Thanksgiving. I am anxiously awaiting Open Beta and with all the christmas game rumors that are circulating I am super excited!